This website is committed to providing helpful content, resources and hiring tips for church leaders. Church leaders who read our content are on the front lines of ministry and often have daily struggles in managing their church operations. Out goal is to help those leaders! We occasionally have church leaders write us and ask questions and we strive to provide helpful answers. Let me start by saying that taking that plunge to hire church employees is a big step that should be thought about carefully. If you hire right it can be a major blessing to your operation. However if you miss the mark on the hire, you will create a challenging scenario that will be difficult to navigate. It is easy to get caught up in the need to fill a position. But before you pull the trigger, make sure there are budget dollars to support this new role. Work with the church budget committee to ensure there are adequate funds designated for salary and benefits. Think also about the cost of a work-space, computer and associated software licenses. The last thing you want is to hire someone and learn that there are no funds to buy them the equipment they need to do the job. Spend some time thinking about the role and what you hope to achieve with this new position. Think through the characteristics/personality type you are looking for. Are you looking for someone who is friendly who talks a lot? Or someone who can focus on detailed tasks? The first would be good for a receptionist, the latter would be good for someone who does a lot of computer work. 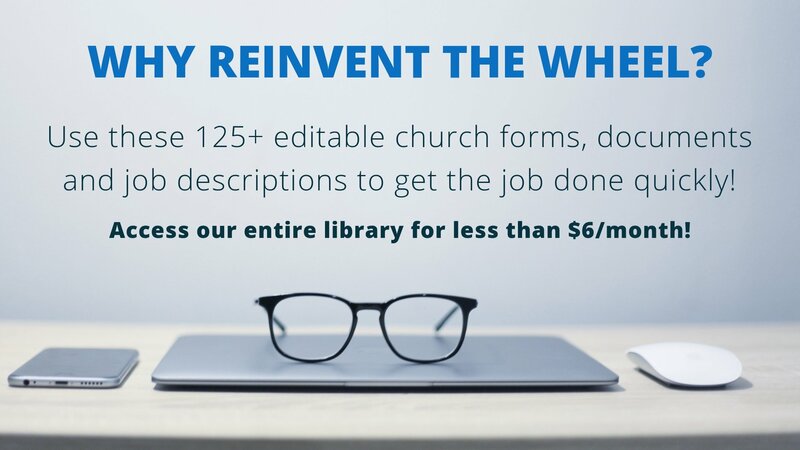 Create a detailed church job description. It’s easy to assume a new hire can read our minds, but they can’t. Take the time to write down exactly what you need them to do every day. The more details you can provide the easier it will be to get the person up to speed. Also set some employee goals for this new hire so they have some targets to shoot for. For instance, if you are hiring a volunteer manager, set some goals that focus on volunteer recruitment, training or satisfaction. Nepotism typically doesn’t work out well and for some reason churches do a lot of it. If you want the kids involved in church, test their commitment by letting them learn leadership through volunteer opportunities. In case you do hire a relative, find a strong mentor within the ranks who can help to hold them accountable and coach them on job skills and performance targets. Churches get into trouble all the time because they hire church members who are not qualified to do the job. Just because someone goes to your church doesn’t mean they will make a good employee – often the opposite is true. This can make for some awkward conversations but it is much easier to dodge a bad hire on the front end – rather than the back end of a hiring process. A member may get offended when they are not chosen for a role, but that pales in comparison to the offense that comes when a church needs to terminate an employee. Hire for talent, not relationship. You can hire the most talented person around but they have a bad attitude the skills are useless. Remember that skills can be taught – attitude can’t. If you are interviewing a job candidate that doesn’t have the technical skills that you need, but a positive attitude, assess whether you think they are capable of being taught. Spend some time to identify appropriate training before you hire them so you can send them to training before they start their job and get too deep into daily responsibilities. For instance, if you need to hire a church secretary and find someone who would represent the church office well, find out what the gaps are in skill set and seek out training. Whether that is computer, software or bookkeeping training. You may be overwhelmed with the need for help but slow down and hire slow. This may not be a popular tip but trust me you will reap the benefit of thinking through your hiring decisions. Take your time to make sure you find the right person, with the right attitude who can help you fulfill your church mission. Someone said hire slow – terminate fast. These are words of wisdom! It takes people for a church to operate. Most of which are faithful volunteers. When your church growth does require you to hire an employee, slow down, think about it and make sure you can afford it!